The Wanderer is an excellent first in series book, Robyn laid the groundwork for us to see the entire town, To learn the layout, the quirky inhabitants, the hidden love stories, the long lost loves, the future residential loves, the newcomers and everyone who had been through. I personally loved that we got to know the side characters, the towns folks and to really get to know Cooper before he met his love interest. 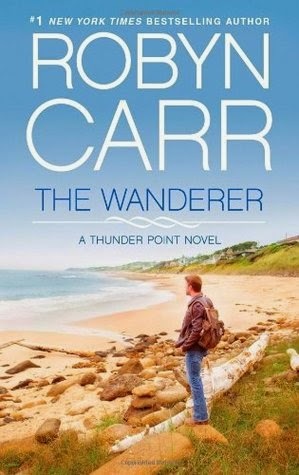 Hank Cooper is a Wanderer, a former Army helicopter pilot he's spent the last few years wandering wherever the wind blew him, when his friend passes away he ends up in Thunder Point to say goodbye to his comrade and get the shock of his life. I loved reading and getting to know Cooper, he wasn't an overly complex man, he had lived it up during his years in the military, he had had relationships and knew how they worked but he's never felt the need to settle down and be in one spot. Thunder Point works it's magic and gives him a glimpse of what life in a community feels like and he hangs around for a little bit. I loved reading the budding romances of the other characters especially because I know she's going to flesh them out in their own stories. We meet some fresh new blood to the town, and even see the hidden lives of a few of the older crowd. Of course you have your characters you want to push out a window, or give a good slap because they clearly need it. And then there are the characters who are so slow they didn't even realize they were about to lose a good thing until it was almost gone. I loved reading those lines and laughing so hard. The love story wasn't insta love, they didn't fall into bed right away either, they were older people with a few years and a few heartaches under their belts so they came at the relationships a little differently. I loved the good slow build to the relationship. I loved the flares of temper, the building of connections that would become friendships and the healing the characters embarked on. Yeah it's safe to say I'm in love with the town and can't wait to return in the next one!! Have you tried Robyn's writing?? If you haven't I suggest you do, she writes in a way that makes you really feel like you're there and could go driving into town any moment. Have any suggestions based on this book?? Share them down in the comments my loves and I'll see you later.